Herman took my dad and me on a boat trip to the Polk Rookery this past weekend. It was my first time being there in the afternoon, so it was fun to see the nests that are not well illuminated in my normal morning light. There don’t seem to be as many nests this year as in past years. There are decent number of Wood Storks, and lots of White Ibis, but not nearly as many Tricolored Herons, Snowy Egrets, or Little Blue Herons as usual. Some Brown Pelicans have nested there in previous years, which is unusual because this rookery is pretty far inland, but we were unable to confirm new nests this spring. 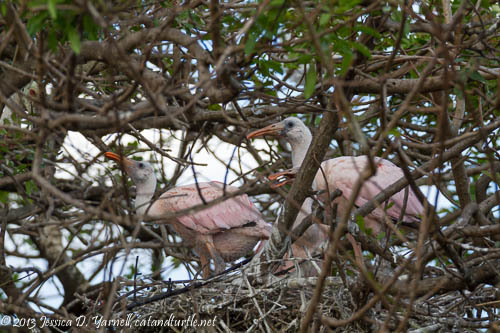 A couple of Great Blue Herons have fledged already, and my favorites, the Roseate Spoonbills, had several nests. It’s always fun to spend time floating up and down the islands with Herman! 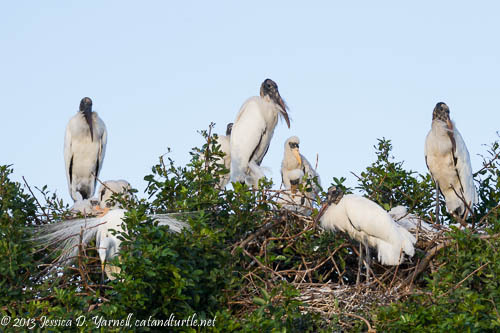 Wood Stork Colony. It takes a village to raise a young fuzzball! Herman has done year-long surveys in the rookery to study the birds and their breeding habits. 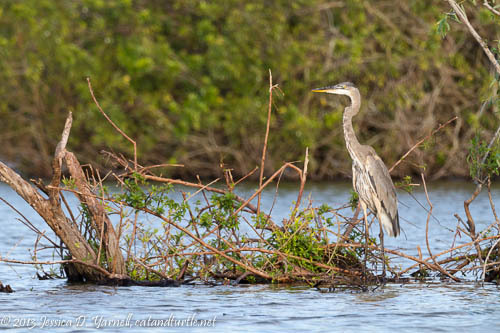 The Great Blue Herons nest earlier than anybody, sometimes starting nest construction as early as November and December. By the time we were there in early April, their babies had already fledged. We came across a lanky young adult sunning himself on a small island. You can tell he’s a juvenile because his head is not as dark as an adult’s. The Anhingas and Double-Crested Cormorants nest year-round in this rookery. Even Anhingas are pretty in their breeding colors, with those bright blue eye rings and the extra flashes of black on their faces. It’s not too hard to find one sunning himself on a branch out in the open. I was glad I’d taken my Beast, which helped me to isolate my subjects. In Full Colors. 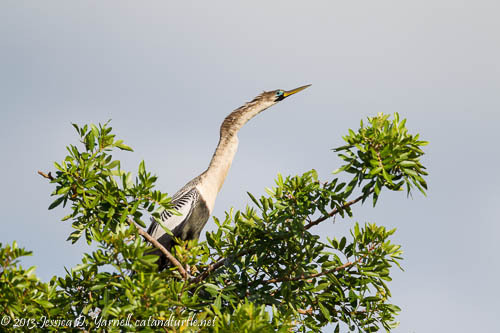 Even Anhingas are beautiful with their breeding colors on. My favorite wading birds are the Roseate Spoonbills. Their fluffy pink wings are just so much fun to photograph! In wild rookeries like this one, the Spoonies nest deep in the vegetation, so it’s virtually impossible to get clear shots of the babies like at the St. Augustine Alligator Farm. But the sticks don’t get in the way of laughing at the babies as they beg for food. I’ve never heard such commotion! They all bob their heads in unison as they demand food from their mom. Feed us! Feed us! The young spoonies are surprisingly loud when they beg for dinner. One of the adult Spoonies was banded, meaning that it had identification bands on its legs. 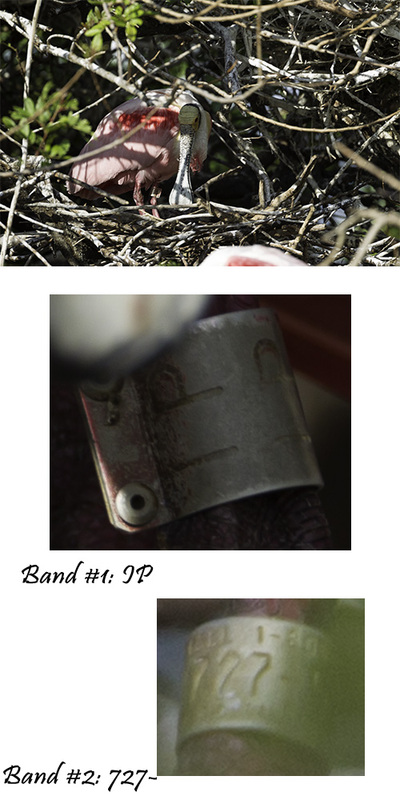 Bird researchers will put these bands on birds, usually when they are babies. Then when people report the banded birds, the researchers learn where the birds travel throughout their lives. We tried to catch the bird standing in good light so that we could photograph the bands. Below are my best views. The top is the bird on the nest. He had two bands, one with “IP” and one with numbers “727-“. I think there were more numbers that I couldn’t see. I’m submitting a banding report to the Patuxent Wildlife Research Center Bird Banding Laboratory, hoping that with the partial band numbers they can at least tell me where the bird was banded. A lot of the Roseate Spoonbills that we see in Lakeland were born at Alafia Banks in Tampa. 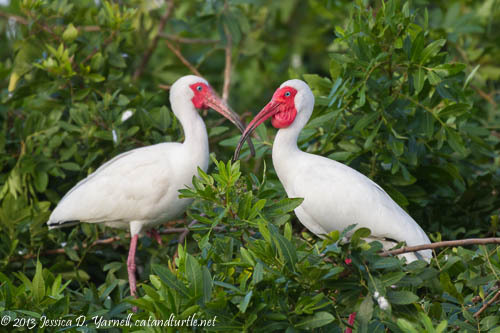 The rookery is just covered in White Ibises right now. They aren’t really nesting yet, but I think they are about to start. Their faces become a very deep orange as part of their breeding plumage. The females also get a little pouch under their chins, like the gal on the right below. 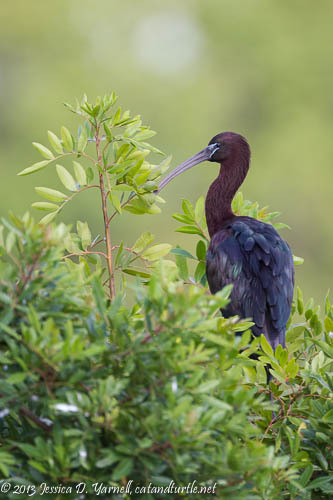 We were surprised to see a couple of Glossy Ibis at the rookery on Saturday afternoon. They are not regulars at this location. It’d be so cool if they nested here! More Glossies are showing up at the rookery this year. I want to see babies! We saw Great Egrets in all stages of breeding. Some were still showing off that fancy lacy plumage and building their nests. Others had small babies. Some had pretty big babies. My favorite shot was of this nest with two little guys. They always posed really nicely for the cameras when the boat drifted by. They are so cute when they are little! You think they are having a really bad hair day until you see baby Tricolored Herons…and then you know what a really bad hair day looks like! 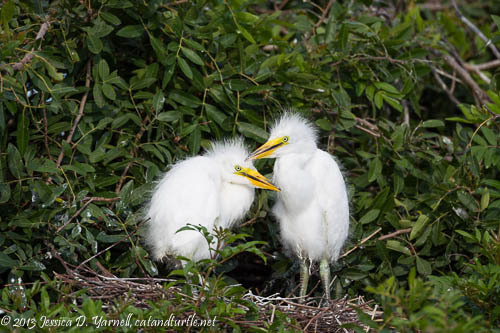 The Cute Stage – I love Great Egret babies! 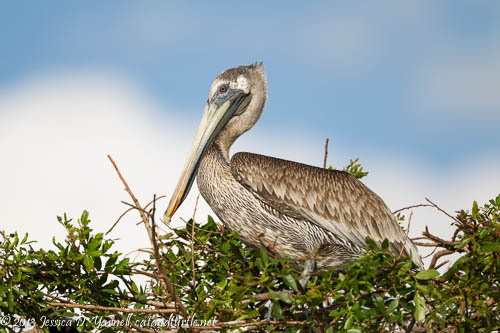 Herman had heard about a Brown Pelican nest, so we searched for it, but never did find it. As the afternoon went on, pelicans started flying in for the night. That’s a part of rookery life that I don’t often see, since I go primarily in the mornings. The pelicans use these islands to roost at night all year round. Brown Pelican – It’s unusual for these birds to breed this far inland. It was a cloudy evening, and the light came and went as the sun passed behind clouds. Just before sunset, the rookery was bathed in really sweet evening light. It was then that we saw our most decorated Cattle Egret of the day. 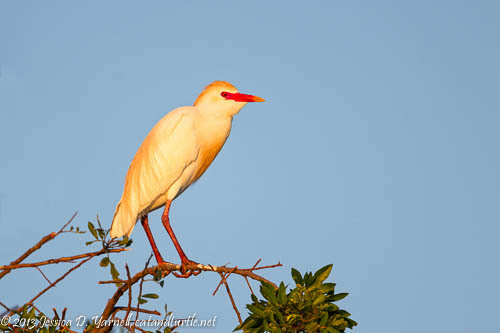 Cattle Egrets are usually plain white birds, but during the breeding season, they get orange accent feathers. At the peak of their breeding time, their legs and beak turn pink. This guy is almost at peak. As the birds headed to their nests for the night, we had to head our boat back to the dock. 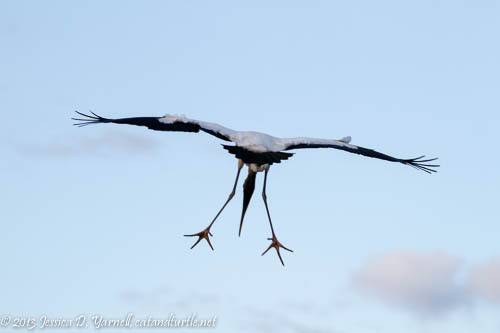 I hope we looked more graceful than this Wood Stork as he lowered his landing gear!